Revealed earlier this year, the ES is in its seventh generation but has never been offered in Western European markets before. It will be sold in the UK as a hybrid-only range, similar to the platform-shared Toyota Camry which replaces the Avensis next year. 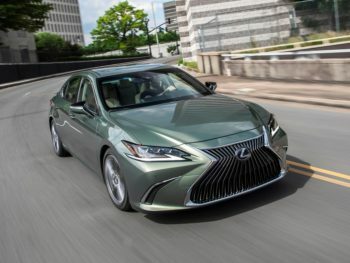 The ES 300h will offer fuel economy of up to 60.1mpg. Priced from £35,150, it also undercuts the GS by nearly £1,000 for the entry-level ES trim, which features kit including the latest-generation Lexus Safety System+, Lexus Navigation with eight-inch central display, parking sensors, power-adjustable, heated front seats, sunroof and 17-inch alloys. The ES F Sport is priced at £38,150 and adds in adaptive sports suspension as well as F Sport interior and exterior styling details, F Sport seats and 19-inch alloys. The top-spec ES Takumi is priced at £45,650 and brings equipment including 12.3-inch display, 360-degree camera, triple-zone air conditioning, power bootlid with hands-free kick sensor, heated and power-reclining rear seats and ‘triple-eye’ LED multi-weather headlights with adaptive high-beam system and adaptive front-lighting system. The GS will still be offered in markets outside Europe, but a spokesperson for Lexus said sales volumes were not high enough to warrant the development work needed to comply the latest Euro 6d Temp emissions regulations, which came into force on 1 September 2018. Last year, the company sold 428 GS saloons in the UK, compared to 4,269 NX SUVs.